This essay aims to analyse the new 2017 Italian law established for the improvement of both the asylum procedures and the contrast of illegal migration in a context in which Europe is required to improve procedures` efficiency without undermining the rights of people in need of protection. Europe is experiencing an unprecedented migration crisis. The phenomenon per se is not new but the Continent has seen a remarkable increase in terms of arrivals over the last few years. On the one hand, the Arab Spring triggered widespread political instability, and wars in countries such as Syria and Libya have pushed massive flows of migrants towards European countries. On the other hand, economic factors are also forcing large numbers of people to leave their countries of origin in Africa and Asia. This mixed-migration movement composed of asylum-seekers and economic migrants poses serious challenges for asylum processes in European countries. When debating refugee protection and related procedures, the main challenges always lie in and derive from politics. Some scholars keep restating that the so-called migration crisis is, in reality, nothing but a refugee crisis deriving from the continuing failure of the CEAS(1) – a set of common standards for the treatment of asylum seekers and applications, aimed in particular at managing migration flows, creating an efficient system for allocating asylum applications among Member States and establishing harmonised protection standards and rights for asylum seekers throughout the EU – rather than arrivals in se. (2) Nowadays, Member States face two main challenges: a) ensuring the protection of people escaping from persecution and armed conflicts; b) the contrast of illegal migration and the threat of extremists infiltrations among migrants arriving mainly on boats. Doubtfully the various changes to the CEAS legal framework have been able to solve this refugee crisis, shifting more responsibilities on countries at the EU borders, such as Italy and Greece. Furthermore, as a consequence of the EU-Turkey statement of March 18, 2016(5) – which has halted the massive influx of migrants from Turkey to Greece and Eastern Europe – Italy has become the European country most affected by migration, with daily arrivals in the order of the thousands. Although accurate data are often difficult to collect, the figures released by Frontex show the seriousness of the situation. According to the agency, a total of 181.376 migrants reached the Italian coasts in 2016. In 2017, instead, 118.962 illegal-border crossings have been detected in the Central Mediterranean route(6) – a significant drop in term of arrivals, but numbers are still noteworthy. Approximately 90% of sea arrivals in Italy left from Libya, in particular from the ports of Tripoli, Benghazi and Zuwarah. 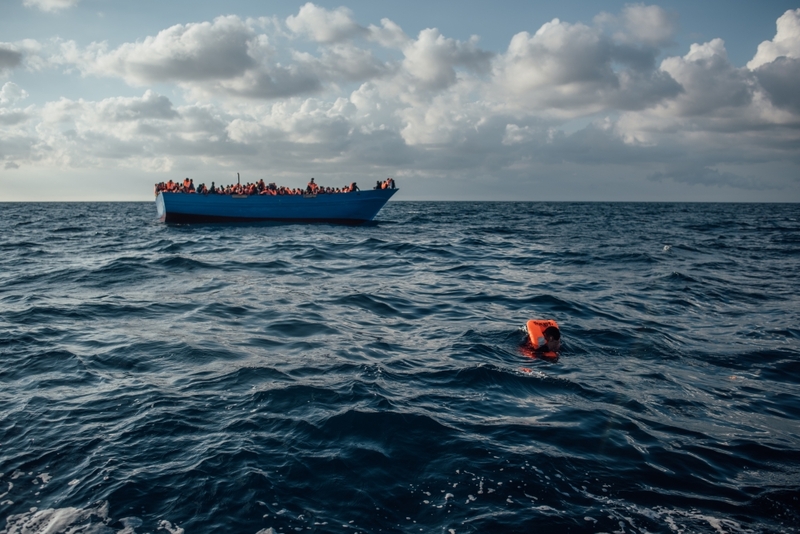 The majority of detected migrants in 2017 came from Guinea, Nigeria, Senegal and Bangladesh but the number of arrivals of Somali, Eritrean and Ethiopian nationals through the Central Mediterranean route is increasing. It should also be noted that not every newly arrived migrant applies for international protection and many of them try to stay illegally in Italy or, in some cases, try go elsewhere in Europe to apply for asylum. Against this backdrop, irregular migration becomes another urgent and pressing challenge to tackle. Moreover, the imperfect functioning of the EU relocation system, which was regulated under the European Agenda on Migration in 2015, is overwhelming the Italian reception system with disproportionately high numbers of migrants. The consequences of this unprecedented situation are, on one hand, the potential infringement of asylum seekers’ rights and conditions and, on the other, tensions within Italy’s social and financial structures. These challenges partially overlap with those posed by illegal criminal networks and terrorist groups. Attempts to tackle these issues have therefore unsurprisingly been at the forefront of the political and legislative debate in Italy. How does Italy internally regulate the migration crisis? Italy has established a huge, sophisticated reception system under the EU regulations and directives (a complex topic deserving a separate analysis). But it has also recently modified part of the legal framework concerning disputes on international protection and the fight against human trafficking and illegal migration. The law regulating these matters, law n. 46 of April 13, 2017 – previously, decree law n.13/2017(7) – modifies various previous norms in light of the necessity to adopt faster procedures to assess the claims of the huge number of migrants and asylum seekers reaching Italy. This new law aims at better protecting the rights of the migrants and deserves special attention since the “urgent provisions” it lays down seem to represent a sort of alarm call to draw attention on the Italian case. First of all, the most significant innovation introduced by the law 46/2017 is the creation of 26 specialized sections (the decree-law 13/2017 had foreseen 14 specialized sections) based out of the ordinary tribunals where the appeal courts are located. The creation of these new sections with specialized personnel is unprecedented. The goal behind them is to accelerate all related procedures, provide applicants with additional rights and ensure the procedures’ fairness. These sections have territorial jurisdiction based on the place where the authority (Territorial Commissions) that has adopted the appealed measure is located. Italy’s Constitution prohibits the creation of special or extraordinary judges; yet, specialized commissions do not run afoul of the provision as, according to article 102 of the Italian Constitution, they are specialized sections established within ordinary judicial venues. The so-called Territorial Commissions (Commissioni Territoriali), revised by Legislative Decree n. 220, of December 22, 2017 – which entered into force on January 31, 2018 – are the bodies in charge of examining international protection claims filed by migrants through the police. They are issued in a maximum number of 20, distributed throughout Italy, and composed of four members: a prefect, a police officer, a representative of a territorial entity and a UNHCR representative. Asylum seekers can be granted three different protections: 1) refugee status, which gives a 5-year international protection. People considered meeting all criteria mentioned in the 1951 Geneva Convention – ratified and implemented with Italian law n. 722/1954 – can enjoy this kind of protection, which entitles them to apply for the renewal on expiry and for the Italian citizenship after five years of residence; 2) subsidiary protection – included in article 2 (g), Legislative Decree 251/2007 – is provided for third country nationals or stateless persons who do not qualify as refugees, but who – based on substantial grounds – would face a real risk of suffering serious harm in case of return in their state of origin. This kind of protection is valid for three years and renewable on expiry, and provides applicants with the possibility to have a permit of stay for work reasons; 3) humanitarian protection – from 6 months up to 2 years – it is a residual form of protection(11) available to those who are not eligible for refugee status or subsidiary protection but can be granted a permit of stay by the police authority – upon request of a Territorial Commission – because of serious reasons of humanitarian nature. In this case the benefits differ from those guaranteed by the first two protections – defined in article 5, Legislative Decree 286/1998. When asylum seekers submit a claim for international protection, they are granted a temporary permit of stay in the Italian territory for a period of six months, renewable according to the procedural time for examining the claim. Beyond the increase in resources for Territorial Commissions, law n. 46 has amended the previous Legislative Decree n. 25, January, 2008 and added new provisions in order to better comply with the Dublin Regulation. First of all, under the terms of article 27 of the Dublin III Regulation, the law establishes specific provisions regarding the possibility for the party to appeal against transfer decisions issued by the Territorial Commissions on international protection granting. The appeal has to be submitted within 30 days of the notification of the transfer decision. The specialized section deliberates in closed session and has to issue a verdict within 60 days after the appeal has been lodged. The party can only appeal against the measure before the Supreme Court (Corte di Cassazione) within 30 days of the notification of the measure. In this way, the number of appeals allowed in case of rejection of the asylum application is reduced from three to two levels of judgement, thus resulting in faster and simpler procedures. (12) It should be noted that 1) the effectiveness of the appealed measure can be suspended when serious and detailed reasons exist; 2) the Territorial Commission has the right to bring legal proceedings and issue a defence statement including proof or circumstantial evidence constituting the grounds of the transfer decision; 3) the applicant can also submit defence statements; 4) the judge can ask for the summoning and appearance of the parties only when he/she deems it necessary for the decision. By modifying article 14 of legislative decree n. 25, January 28, 2008, the law has introduced video recordings of the interviews in which applicants request international protection before the Territorial Commission. The video recording is then translated into Italian, but the applicant has the right to read all relative transcripts in a language that he/she understands and with an interpreter’s support. The applicant will then receive a copy of the transcript in Italian. All documents – the video recording and relative transcripts – are stored in an appropriate computer archive for a period of 3 years in order to guarantee the documents` integrity. Furthermore, law n. 46 provides for the possibility for the applicant to submit a reasoned claim against being video recorded. The final decision issued by the Commission cannot be appealed. The law also set out some conditions – including technical issues – according to which the video recording cannot take place. It is worth nothing that, in comparison to article 5 of the Dublin III Regulation, this new Italian provision on personal interviews provides the applicant with more guarantees. Indeed, while Dublin III limits them to the presence of a qualified interpreter, a comprehensible language for the applicant and a clear summary of the interview, Italian law (by also introducing the video recording and the relative appeal), increases the protection of the applicants’ human rights. Furthermore, while article 5 of the Dublin III Regulation provides for the presence of the interpreter only when necessary, the new Italian provision states that the interpreter is present in all cases. The law in question has also partially modified the 2008 Legislative Decree with regard to the granting and withdrawing of refugee status. The amendments provide for a new legal process lasting up to four months and taking place in closed session. The party has the right to appeal within 30 days of the notification of the measure or, if he/she does not live in Italy, within 60 days. Except for some cases (for example, when the appeal is considered to be invalid), the appeal has the effect of suspending the measure’s enforceable effectiveness. The appeal notification is sent to the Ministry of the Interior, to the Commission or Section which adopted the measure and – limited to the cases of cessation or withdrawal of international protection – to the National Commission for the Right of Asylum. The appeal is then sent to the public prosecutor who draws the conclusions and identifies any potential reasons against the granting of international protection. Within 20 days after the appeal has been notified, the Ministry can submit a defence note. Within the same terms, the Territorial Commission has to disclose a copy of the international protection claim, the video recording and all related documents, including those showing the economic, political and social situation of the country of origin of the applicant (that the judge shall also consider in issuing the decision). As provided by law n.46, the judge can order the personal appearance of the parties when 1) despite the video recording, there is a need to hear the applicant; 2) the judge considers that further clarifications are necessary from the parties 3) the judge requests technical advice. Moreover, the parties shall be convened when at least one of the following circumstances applies: 1) the video recording is not available; 2) the interested party has requested to be heard and his/her motivations are well-founded and essential for the decision; 3) new elements have emerged. It should be noted that the applicant can also submit a defence note. The Tribunal has to reach a decision on whether to grant international protection or not within four months of the filing of the appeal. Regardless of whether international protection is granted or not, the final decision of the Tribunal cannot be brought before the Appeal Court. In case of rejection, in fact, the party can only bring the case before the Supreme Court within 30 days of the communication of the verdict. The Supreme Court has six months from the complaint’s filing to issue its final decision. While reducing the number of appeal proceedings allowed, the law seeks to intensify the protections granted by Territorial Commissions, making them identical to those previously granted in second instance. It should be also noted that law n. 46 aims at integrating both refugees and asylum seekers in the social fabric by including the possibility for Prefects (the State’s representative in a province) to issue memoranda of understanding or other kinds of agreements with municipalities and NGOs for the promotion of socially useful work projects, which asylum seekers can join on a voluntary basis and without remuneration. In order to fund these projects, municipalities can use European resources earmarked for the immigration and asylum sector. Law n. 46 has modified many aspects of Legislative Decree n. 286/1998 – concerning the Italian provisions of law on migration issues. First of all, it states that when a person is detected while illegally crossing Italian borders or rescued at sea, he/she should first be brought to reception centres located at dedicated hotspots. Here, the migrant will be provided with medical treatment and subjected to identification procedures – such as taking a digital fingerprint and photograph – according to European Regulation n. 603/2013. On that occasion, the migrant will be also informed about the possibility of AVR. The above-mentioned European Regulation prescribes identification procedures also for everyone found illegally on the Italian territory. However, any repeated refusal to submit to identification procedures is considered to be compelling proof of a risk of absconding for the purposes of detention in what are now called “Detention Centres for Repatriation” (CPRs). Indeed, it should be highlighted that law n. 46 has changed the name of previous detention centres for the repatriation and expulsion of irregular migrants from Identification and Expulsion Centers (CIEs) to Detention Centers for Repatriation (CPRs). These new centres will be distributed throughout Italy in a number of 18 with a capacity of 100 people per centre and located far from cities and closer to airports in order to facilitate expulsions. A guarantor of the human rights of detained people with monitoring powers will be also provided in order to ensure fair treatment and good conditions within the centres. Inevitably, return and readmission policies have to be supported by cooperation, in the form of multilateral or bilateral agreements with relevant parties. Yet, their implementation could encounter practical obstacles. This is because repatriation is a complex process involving nationality identification procedures and the need to gather all documents required to return migrants. There are many challenges to be addressed such as: 1) the lack of automatically connected systems between countries slows down the identification process 2) the repatriation process could represent an additional burden for the security apparatus of countries that are already facing various domestic challenges. Furthermore, some countries may be not interested – or unable to take part in search and rescue operations and deploy more security personnel to arrange and check the arrival of irregular migrants. Italy is making major efforts in enhancing cooperation with Libya, one of the most crucial partners in the Mediterranean. However, due to the country’s political instability, goals are quite far away from being achieved. Moreover, further monitoring efforts will be made in order to counter criminality and terrorism. Lastly, the Italian Minister of the Interior recently hosted a roundtable with authorities from Chad, Libya and Niger with the aims of: 1) intensifying cooperation on counter-terrorism and human trafficking; 2) supporting military training 3) helping Niger and Chad create new reception centres for irregular migrants in accordance with international humanitarian standards 4) building a legal economy which may replace illegal networks, especially human trafficking and 5) providing substantial support to the reception centres for irregular migrants in Libya. In order to effectively implement these resolutions, the four countries involved have established a monitoring body that will periodically conduct internal consultations. The spirit of the analysed law seeks to enhance and improve the ability to respond to refugees and asylum seekers as soon as possible trying to ensure that fair process and justice are fully respected. Nevertheless, the necessity to cope with illegal migration and the threat of extremists’ infiltration into Italian soil have induced the government to reinforce the expulsion and detention system. Given this, the new system is not without imperfections. Some provisions should be better regulated – i.e. grounds allowing to longer detentions – in order to avoid an excessive margin of discretion which would potentially exposed to the risk of abuses. The Italian government, the EU and the international community have an important role to play to promote stabilization and peace by assisting in strengthening the judicial, political and social systems of various African countries. Most recently, this point has been particularly stressed during the G20 Africa Partnership in Berlin. Private and public investments in migrants’ African countries of origin and transit would have a positive impact on their development and security. The main goal should be the introduction of common best practices for the management of migration flows from many African countries. The main pathway to pursue this goal is improving relationships with crucial countries of origin and transit of migrants. As previously highlighted, this form of cooperation could lead to mitigate the migration crises, counter the smuggling of migrants, human trafficking and the threat of terrorism. Clarissa Spada is a LLM student in International Law in Armed Conflict at the Geneva Academy, following a specialization on European migration policies. She holds a law degree with a specialization in International Law from LUISS Guido Carli, Rome. She had working and training experiences at the Italian Embassy and the European Delegation in Washington, DC; and UNICRI. Clarissa Spada is currently Project Manager and Head of Research of a project on organized crime and terrorist infiltrations inside Italian seaports. The CEAS has been subjected to two main reform packages. The first package (1985-1999), when the system was firstly established, and the second one (2004-2013), when the system was consolidated. Nowadays, further reforms are ongoing. In 2016, a fourth revision of the Dublin agreement was proposed with the main idea of improving the resettlement mechanism and to establish a better system for identifying the state competent to asses asylum applications. v.. chetail, the Common European Asylum System: Bric-a-brac or system? Criminal Justice, Borders and Citizenship Research Paper No. 2564990, 2016. European Union, (2014). A Common European Asylum System. Publications Office of the European Union. URL: http://ec.europa.eu/dgs/home-affairs/e-library/docs/ceas-fact-sheets/ceas_factsheet_en.pdf. v. chetail, Looking Beyond the Rhetoric of the Refugee Crisis: the failed Reform of the Common European Asylum System, European Journal of Human Rights, 2016/5. Regulations are immediately applicable and enforceable by law in all Member States. As good practice, Member States issue national legislation that defines the competent national authorities, inspection and sanctions on the subject matter. Directives, instead, are applicable to all Member States but they set certain aims, requirements and concrete results that must be achieved in every Member State. Furthermore, they set a process for it to be implemented by Member States. National authorities must create or adapt their legislation to meet these aims by the date specified in each given Directive. The decree, then converted into law, was issued by Marco Minniti, former Minister of the Interior and Andrea Orlando, former Minister of Justice. The Legislative Decree 30/2007, art.7, provides criteria according which a EU citizen can remain in Italy longer than three months: 1) study reasons 2) work 3) if the individual has enough economic resources to live in the country without requiring any public support 4) if the individual is a relative of an EU citizen holding one of the above mentioned criteria. Art 14 gives specifications how an EU citizen can acquire a permanent residence permit in Italy and thus, when the individual have lived legally and continuously for five years. Art 15 foresees situations in which an EU citizen can acquire the permanent status before these five years. Available at http://www.camera.it/parlam/leggi/deleghe/07030dl.htm. In the first two cases, the specialized sections will rule en banc. Otherwise, and in exception to the common procedures, sections sit as single judge. The law gives specification on the composition and structure of the specialized sections and on judges` skills. (art 3). The Legislative decree 30/2007 provides details on when an EU citizen can be removed from Italy: in case of public safety and public order. In cases of EU citizens with a permanent residence permit, they can be removed only in cases of serious circumstances of public safety and public order. The principle of proportionality must be always respected. (art. 20). Available at http://www.camera.it/parlam/leggi/deleghe/07030dl.htm. It is a peculiar form of protection since Italy is the only member state providing asylum seekers with a third possibility. Disputes are directly brought before the Supreme Court and not before the Appeal Court (Corte d`Appello).